Have you always wished you could draw? Would you like to improve your drawing skills? If your drawing skills need developing there is no better way to do this than with a 5-day Drawing on the Right Side of the Brain workshop. However, I am down to my last few places for this year with only a couple of spaces for August, so if you are interested please do get in touch so you won't be disappointed. This course is now fully booked but I am running a waiting list. "I'm so pleased I came on the course. I never would have believed how I improved... Really really really delighted! Really impressed with course content and how it develops. Made drawing seem a really straightforward skill to learn." When you are drawing it’s very easy to get so caught up in trying to render what you see in terms of angle and proportion that you forget about the power of line. 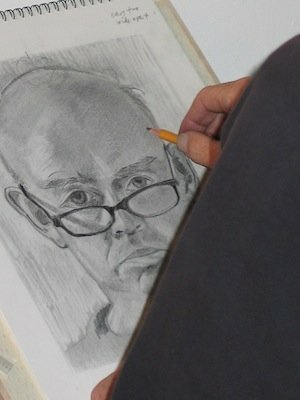 If you look at drawings done by the Old Masters and other artists, the line of the pencil is in constant movement and change – thick, thin, light, dark, solid, broken, repetitive... Take a moment to look at some Old Master drawings and notice how the different line styles give you different types of information and create interest. A contour line that breaks might suggest light hitting that particular spot. If you think of line as the language of a drawing, you want that language to speak volumes – to convey mood and evoke emotion as well as describe the subject. Vary the pressure on the pencil – what do you notice? Experiment with how you hold your pencil – what do you notice if you hold it close down to the tip? How about if you hold it higher up towards the end? How does the position of the fingers affect the mark made? Experiment with drawing the same object in a variety of different pencil styles. Notice how a particular style of mark may convey a particular feeling tone to the drawing. Experiment with different drawing tools – a stick dipped in ink, a quill pen, a hard pencil versus a soft pencil – the options are endless. Different tools speak different languages. What do you want your drawing to say? Each of us has our own unique style of making a mark with pencil but that doesn’t mean you can’t explore and extend the range of marks you can make. When you increase your vocabulary of marks it will empower you to make conscious deliberate decisions when you are drawing to use a particular type of pencil mark to convey particular information.